Spanish food has been making big waves on the food radar, with new tapas bars popping up every month. 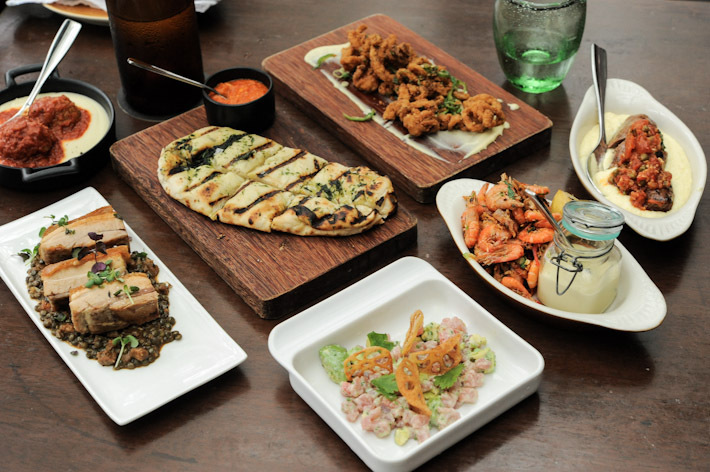 If you are a fan of tapas, Salt Tapas & Bar at Raffles City by celebrity chef Luke Mangan is one place that you should check out. It serves Aussie-style tapas with the freshest ingredients. 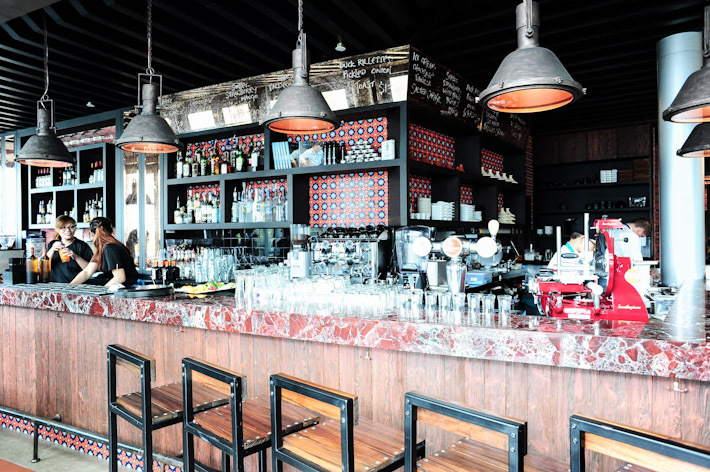 Many people have the perception that Salt Tapas & Bar is very expensive. This is true. Most of the tapas are in the $20 to $30 range, and you can easily spend at least $100 for a meal here. But what you might not know that it has a fantastic lunch set for just $33.50++/pax. It includes a flat bread to share, and 3 tapas per person. When you consider the fact that most of the dishes on the set lunch menu are from the ala carte menu, you will agree that it is a very good deal. The set lunch menu is essentially a scaled down version of the main menu. Both are divided into different categories: ‘Nibbles’, ‘Butcher’, ‘Garden’, ‘Sea’, ‘Paddock’ and ‘Sweets’, Below are some of the dishes that we ordered from the set lunch menu. I have also included the ala carte portion prices. Salt Tapas & Bar has several options under their ‘Garden’ menu which include Heirloom Tomato Salad ($11), Beetroot & Red Capscium ($12) and a Rocket & Pear Salad ($9). We started off with a superb Tuna Tartare ($19 for small, $27 for large) with wasabi mayo and ruby grapefruit from the ‘Sea’ menu. We also had the Crispy Soft Shell Prawns ($15) with chilli and garlic aioli, and while it was not a scene stealer, it did not disappoint with its crisp and crunchy texture. Another dish that was even more addictive than the Soft Shell Prawns is the Salt & Pepper Squid ($20) with lime mayo. The crunch squid was well-seasoned with salt and pepper, and it was perfect with lime mayo. Simply put, I’d not leave Salt Tapas & Bar without trying this. From the ‘Paddock’ menu, we had the Wagyu Sausage, Sumac Spiced Veal and Confit Pork Belly. The Confit Pork Belly ($27) with lentils and chorizo was a let-down. It was a tad too tough and not as tender as I’d hope it would be. The Wagyu Sausage ($14 for small, $25 for large) with polenta, capers and tomato was good, but what stood out was the accompanying polenta. We suspect they added in a lot of cream and butter to give the polenta a creamy and smooth and velvety texture. Also good was the Sumac Spiced Veal & Meatballs ($14 for small, $22 for large) which came with a very yummy fontina mash. Desserts are also worth a mention. 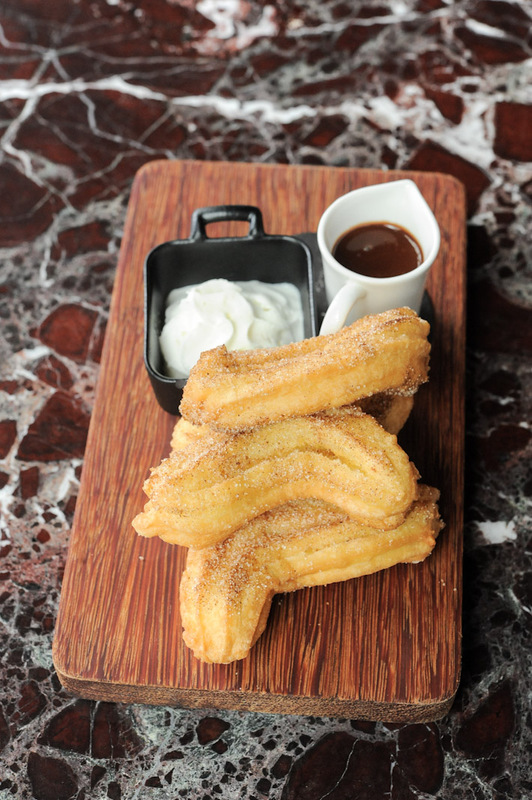 Not many places serve good churros in Singapore, and if you have been looking for it, you must try Salt Tapas & Bar’s Churros & Chocolate ($11). It is one of the few that has managed to impress me so far. You also cannot go wrong with the Gooey Hot Chocolate Tart with caramelised banana and white chocolate ice cream ($14).